At the Canadian Commercial Savings Group, they have one mission: to reduce operating costs for taxi drivers. 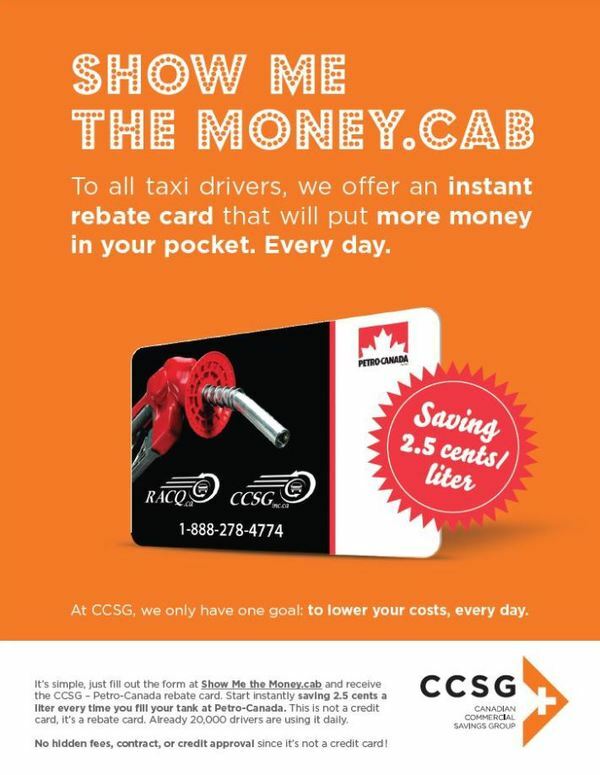 CCSG have signed an agreement with Petro Canada to save each taxi driver 2.5¢/liter of gas directly at the pump. With the CCSG Petro-Canada card, taxi drivers get an instant rebate on gas and collect Petro Points with each fill up, regardless of the payment method used. This is not a credit card, it’s a **rebate card**. Over 20,000 drivers already enjoy substantial savings on their gas expenses every day. This opportunity is now available to drivers in Ontario. To take advantage of this opportunity, simply go to ShowMetheMoney.cab and fill out the registration form. It’s easy and free and drivers receive their cards within 7 days. The information collected will remain confidential and is kept solely for the purposes of improving services.